Well, that’s it. You’re done. You’ve plugged in your flash drive a dozen times, with nothing to show for your efforts but “flash drive not recognized.” Actually, the screen taunted you with ”flash drive not responding” the first time, and that certainly didn’t help. You’ve used this USB drive for years, and it’s got a ton of everything that matters to you on it. Your frustration level is running high, but take a deep breath. You may just have a dead controller. No, dead is never good — for anything — but the situation is not as hopeless as it may seem. HDD Recovery Services can just about guarantee it, and here’s why. Initially, the process appears to be — well — a no-brainer, but it can seem as complex as a human organ transplant. 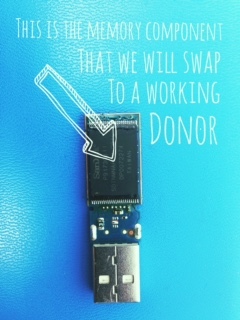 Just as the medical transplant community has to consider blood type, cross matching and tissue type, memory component transplants require a donor flash drive with a matching controller part number, board number and size. Unfortunately, unless you have access to hundreds of potential donors, the search can rapidly take on needle-in-a-haystack proportions. Manufacturers don’t list specs for flash drives on the label, and they enclose drives in packaging and a plastic shell. Memory technology has been expanding quickly, with flash drive capacities increasing, too. As soon as a manufacturer upgrades/changes a design, old versions are no longer available, so you may think you have the right donor flash drive only to open it up and find — much like a bad lottery ticket — all the wrong numbers. What if, however, you had a whole stack of lottery tickets that you could keep opening until you discovered the winning number? That’s exactly what HDD Recovery Services has. We maintain an inventory of hundreds and hundreds of flash drives. Chances are, if you need it, we’ve got it, and once we’ve found your matching donor drive, the process of flash drive recovery is a matter of simple steps, a bit of know-how and some finesse. All we have to do is remove the memory component from your dead drive and let it soak a bit in an isopropyl alcohol bath. Meanwhile, we remove the memory component from the donor flash drive and clean the donor body thoroughly to make sure it will make complete contact with your memory card. Then, it’s a simple matter of reassembling the unit, plugging it in and watching your data files appear. Cruzers are SanDisk’s most popular model of USB drive, but HDD Recovery Services specializes in all of them. In just the last 3 years, we’ve serviced over 800 SanDisk flash drives, with nearly a 100% success rate. Many had issues with broken connectors, allowing us to build our extensive inventory of donor drives and our diagnostic and data recovery expertise. We can transplant your Cruzer U, Force, Facet, Switch, Edge, Blade and Glide, as well as your SanDisk Extreme, Extreme Pro and Ultra, flash drives. The Fit, POP and Orbit drives, however, are monolith drives; the memory components are cast into a single piece of plastic and rely on NAND chips rather than a circuit format. 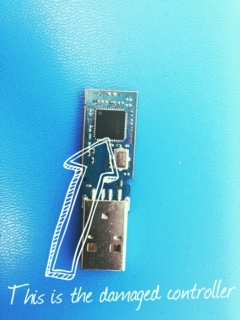 Recovering data from them is a delicate process of removing layers of plastic without damaging the underlying circuitry. We can do it, but it’s a different process. For the majority of the SanDisk flash drives, however, if a dead controller is the problem, HDD Recovery Services can transplant your data in a flash onto a new donor flash drive. Simply follow the instructions on our website to ship your unrecognized, unresponsive USB drive to us. Our expert team will assess your drive in our lab, diagnose the problem and recover your data. As always, we offer a 100% guarantee — no data, no fee. Now, don’t you wish your human memory component issues were as easy to fix?